What are some specialties of physiology? Specialties and subdivisions of physiology include cell physiology, special physiology, systemic physiology, and pathological physiology, often called simply pathology. Cell physiology is the study of the functions of cells, including both chemical processes within cells and chemical interactions between cells. Special physiology is the physiological study of specific organs, such as cardiac physiology, which is the study of heart function. Systemic physiology is comparable to systemic anatomy since it is the study of the functions of different body systems, such as renal physiology and neurophysiology. Pathology (from the Greek pathos, meaning “suffering” or “disease”) is the study of the effects of diseases on organs or systems and diseased cells and tissues. 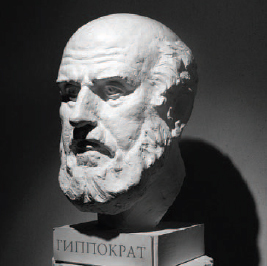 Most people consider Hippocrates the founder of the discipline of medicine; and the Hippocratic oath—the code of ethics followed by physicians—is also named after him. © iStockphoto.com/Phil Sigin.